I had been expecting to get kick out of the PayPerPost all time top earners top ten list for a few months already. I have stopped writing paid posts for PayPerPosts lately because it is a decision I made. The test of faith to see if I have the will to blog even if I am not making money. Moreover, I went through two very busy and tough months during May and April and I cannot manage the thought of making money on top of all the obligations I had to do. But surprise, surprise, my ranking on the 10th position was somehow pushed up to the eighth. I think PayPerPost added my PayPerPost Direct income plus the referral fees income which caused me to rise again. 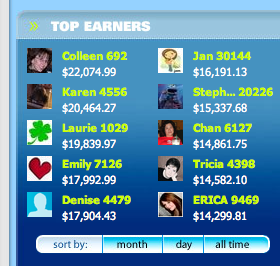 So, let me enjoy this little moment before I am totally gone from the top ten positions as PayPerPost top earners. It won’t be long now before my face disappeared……I have only USD9 pending in PayPerPost. That is nine freaking US dollars and not 9K, ok? Gone were the days when I used to make USD1,500 per month from PayPerPost alone. So, did I lose anything now that I have only USD9? No. I had made USD14K in over a year. Now, I have my other means of making money. But ultimately, the satisfaction is knowing that with the USD14K, I can easily put at least two of my sons through college. My eldest son’s professional chef diploma costs RM30K for 2 years 6 months. And thank God that I am so blessed to learn as I earn while I share what I know. I know I had inspired a lot of other people to make money as well. I just hope they know how to appreciate what they had earned and not what they had missed out. Count your blessings, folks. Happiness comes in many ways, not just making money. cash earned on PPP! Congrats! Wow, very impressive! It’s great that you earned so much. It almost makes me want to start PayPerPost myself…but I’m not sure I have the time/energy. wah lilian ahyi, $14k =.=”” Huge Amount !! convert to RM, you can send you son to college d..good good ! Take care of your health as well !! i like it when u said “happiness come in many way…” see, u have your achievement, your get the money! I noticed PPP’s operator getting distracted to other ventures like SocialSpark and RockStartup. Hi Lilian, you are really great and terror for earning so much from PPP. Salute, salute. Thanks for sharing all the making money tips. By the way, any idea how to withdraw money from pay pal here in Malaysia? Your story is amazing. I am trying to make some money for a trip I want to do next year and I hope I get there before I just give up on paid post. I USED to make that amount too but since Google went sniffing around and slicing people PR cuz of paid post, I made literally peanuts from PayPerPost. Not to mention, all of my PR got slashed to zero with no comebacks. Very frustrating. hi Lilian, a question on PPP. I signed up and used my blogname for the first and last name…will this affect anything? Or should I sign up again with my read name :) Opps. it was a great amount.i want to get one too. Thanks for the input, I may have to have a look at payperpost and start blogging for money myself.